Hollybeary Creations : YNS October Release Hop!!! 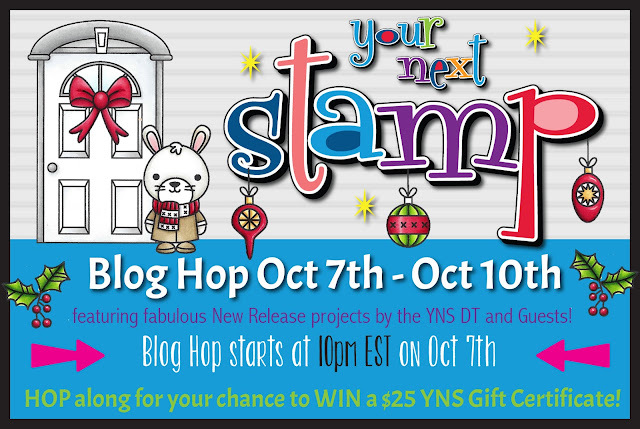 Happy Saturday everyone... Are you ready to Hop along with us as we reveal the Your Next Stamp October Release? Be sure to leave comments along the way for a chance to Win a $25 GC to the YNS store. This month's release is perfect for all your Holiday projects... It's full of new Pattern Papers, Gumdrops, Stamp and Dies!! My first project is a Fun card with a mini action Wobbler for a little movement! 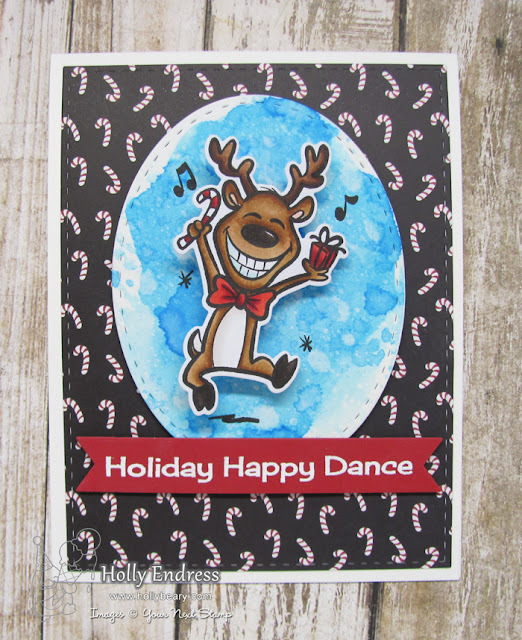 I used the new Be Jolly Set and it's Coordinating die and the new Holiday Joy 6x6 Paper Pad. I also used some Blue Curacao Ink, the Stitched Oval and Rectangle Die sets and the Fishtail Banner Die Set one. I colored the image in with Copic Markers after stamping it in Black Olive Ink.. This is a great ink from YNS perfect for Copic Coloring!! I heat embossed a sentiment from the same set in White on a Red Banner. I used a mini action Wobbler on my reindeer. it's always so fun to see images in action with the Wobblers. 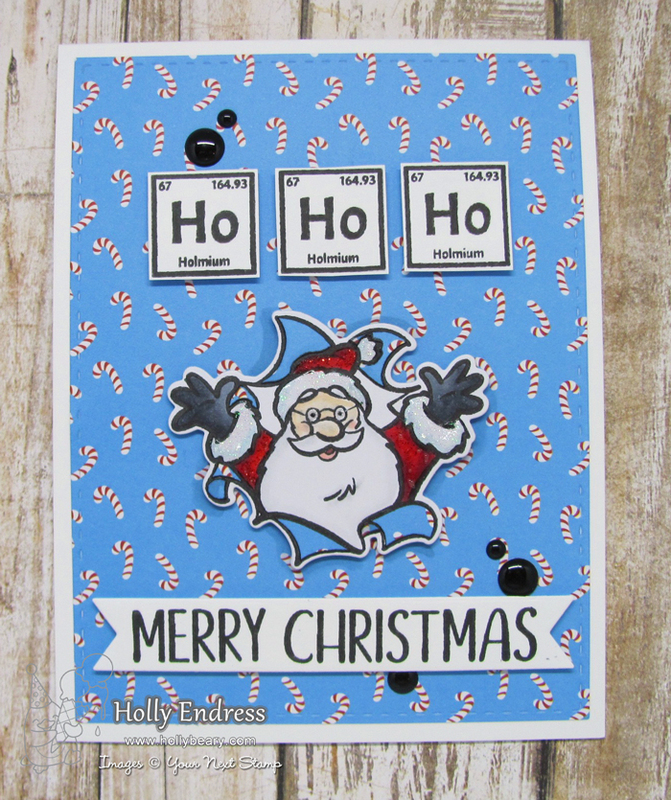 My second project uses the new Holiday Joy paper as well the Be Jolly set and the new Periodically Neardy set. This is a Fun set that lets you create several different words. 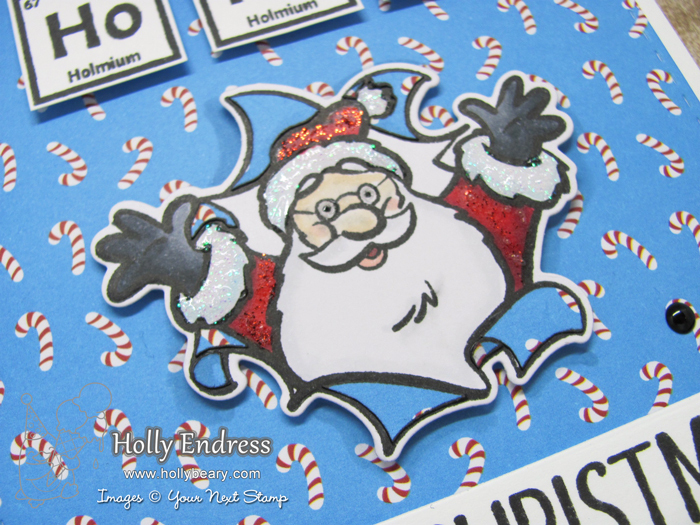 I did some paper piecing around the Santa Image with the same paper as the background and I used some of the new Vintage Holiday Gumdrops. I wanted a little sparkle to the image so I added some Nuvo Drops in Clear Glitter to the White parts of the Santa suit and some Clear to his glasses. I added some Red Stickles to the rest of the suit. Check out all the Fun words you can create with the new set!!! Are you ready to Hop along and see the other new products now available from the release? Be sure to leave comments along the way for a chance to Win a GC to the store!! Lots to comment on. First, the Santa is well done. Secondly, while reading down your blog, then coming upon the third picture... what a surprise!!! A wobble! 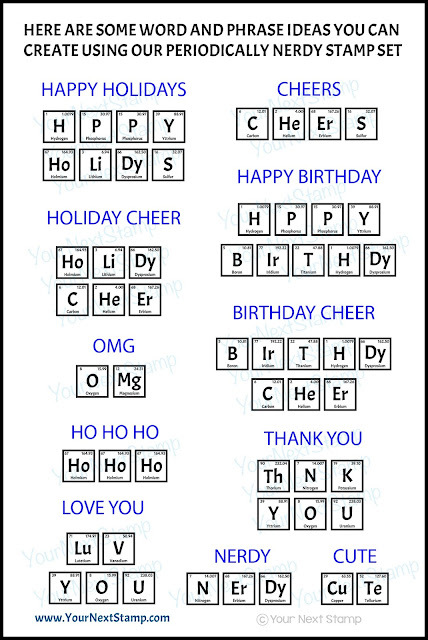 Thirdly, Thanks for the list of words that can be made using the Periodically Nerdy. Your cards are so much fun! Love the reindeer on a wobble!! Love your cards. They are so fun. I love all those fun images and the backgrounds here are just wonderful! Love,love,love both of these! So great, can't stop laughing at the reindeer. Such fun and cute cards. I totally thought that deer needed a wobblie and then bang, there it was.. So perfect. Love your santa bursting out from the card. Really great job on these. Your cards are both so much fun! Love the wobble, of course, but even Santa is fun with that awesome expression. The reindeer just makes me smile! Your cards are fabulous...love the lighthearted feel of them for the holidays! love thenerdy stamp set!!! tooo cool!!!! Love those super awesome cards! gah! Your cards make me smile! I love the wobbly reindeer! he's so funny! That reindeer just makes me smile! He's just so cute and happy and I love how Santa is bursting out of the paper like a present! TFS! Oh your cards are so fun!! I wanted to laugh when I seen how happy that reindeer is!! The Santa is so cute peeking out. Thank you for that word chart. Cute cards! I so like the Periodically Nerdy stamps! That reindeer card is so adorable and santa coming out of the packaging also. Thanks for sharing. This card is so whimsical and fun! TFS, this set is a must! Your cards are fabulous. Love the wobbly reindeer. He is so cute. And your Santa card is great. The design and coloring are awesome. Thanks for your great ideas and including the list of words. OMGosh, that reindeer cracks me up! Great cards!!! Oh my what fun Happy cards! Love them both! how cute! love the wobbler! Very cute cards, Love the new releases. 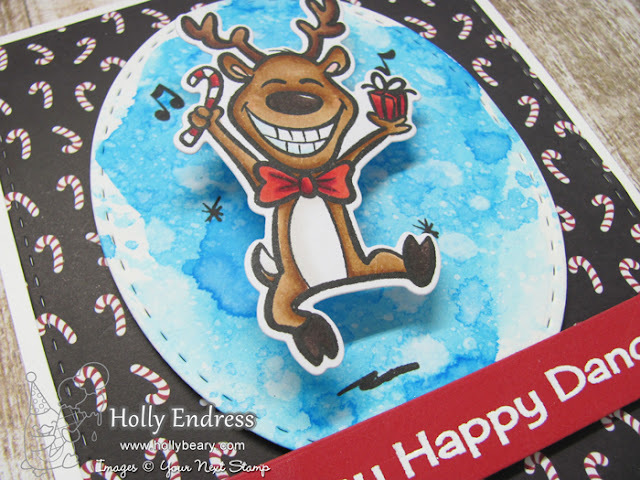 Yes that reindeer deserves center stage...fun cards and great idea using an action wobbler! What a happy little reindeer!! Love your card layout ! Really enjoying all the inspiration from this blog hop. These are two great fun cards !! I love your background on the first one. Oh wow! Two beautiful and SUPER FUNNY cards!!! Love them!!! As a scientist, I love the periodically nerdy stamp set!! Your cards are so FUN! Love the wobbly reindeer! I love the nerdy stamp set and your "nerdy" card! I think the dancing reindeer is so fun, too, Holly! Such great cards Holly. The action wobble is great for this type of card. Just sweet! Adorable cards. Love the wobble on the reindeer. I just adore this reindeer character and I’m lovin’ the fact that you put him on an action wobble! Wow those images on your cards are hilarious! Love the paper piecing. These cards are both adorable! And I thought the first one was fabulous and then I saw the action wobble!! Oh, my goodness, what a great idea to use it with that "dance" sentiment!! Genius! Darling cards! Love that grinning reindeer and cute Santa!